This section is devoted to photography: not of anything in particular, necessarily ..... I took these photographs purely for my own enjoyment. I hope you enjoy them too. 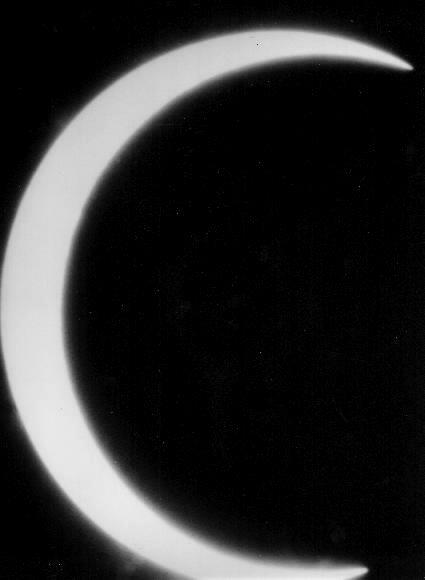 I won't make any claims of artistic merit, but I think it's an interesting shot: this is the peak of a near-total annular eclipse of the sun, taken with a Kalimar medium format SLR and a combination of optics that works out to a 4000mm f/64 telephoto; stopped down to f/320 with a red filter. I printed it on 11x14 paper and it wouldn't all quite fit on the scanner. The camera used can be seen here; the lens shown there is the one that took this picture, with the aid of two 2x teleconverters. I've simply divided this section into groups of color and black & white photographs. There may be an occasional note regarding the equipment used, if (as in the example above) it was particularly unusual. What, Black & White Again?